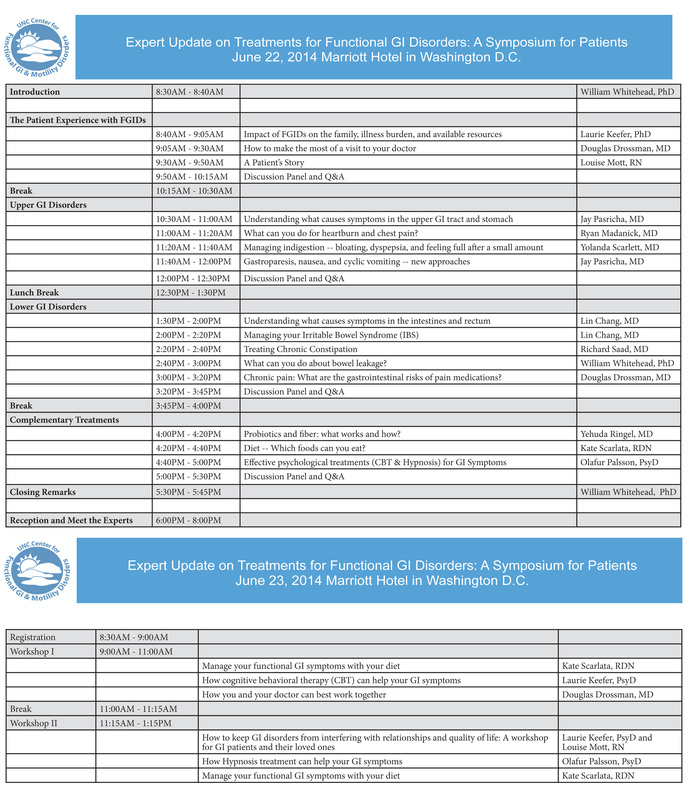 The UNC Center for Functional GI and Motility Disorders will be hosting Patient Day 2014: Expert Update on Treatment for Functional GI and Motility Disorders – A Symposium for Patients in Washington D.C. on June 22 – 23. The event will be held at the Washington Marriott at Metro Central. Discounted rates for hotel accommodations can be found here. Information on transportation to the hotel and/or airport can be found here. This year, the agenda for patient day will be somewhat different from 2012. We will continue have lively and informative presentations on upper GI disorders, lower GI disorders, and complementary therapies that will be live streamed over the internet as well as attended in-person. Online audiences will still have the opportunity to submit questions and have them answered in real time. The biggest change includes the addition of two in-person interactive components; (1) Reception after the lectures on June 22 to meet the experts, where patients can visit with speakers over light refreshments and, (2) On June 23, experiential workshops where patients choose to participate in 2 of 6 different 2-hour courses focusing how to self-manage their functional gastrointestinal disorder. The Experiential workshops will only be available to in person participants due to HIPAA laws on patient privacy and protection. Previous Patient Day’s online viewership included participation from 29 states, India, Jamaica, UK, Canada, and Australia. This year Patient Day will be held in Washington DC, one day before the International Foundation for Functional Gastrointestinal Disorders (IFFGD) Advocacy Day on Capitol Hill. Information on Advocacy Day can be found at http://www.dha.org/events/1014. Faculty from UNC that will be presenting during Patient Day include Drs. Ryan Madanick, Yehuda Ringel, Olafur Palsson, and William Whitehead. For more information about Patient Day 2014, visit www.fgidpatientupdate.com or contact Stefanie Twist at sjeremia@med.unc.edu or 919-843-6961.